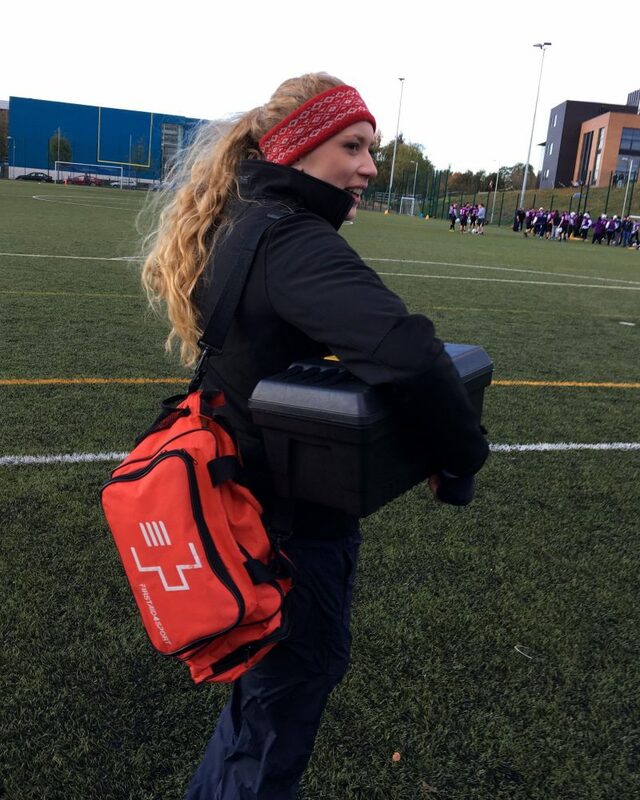 I decided I wanted to take up the opportunity to become a positional coach in order to increase my understanding of the game and benefit my practice as a Sports Therapist and Strength and Conditioning coach. 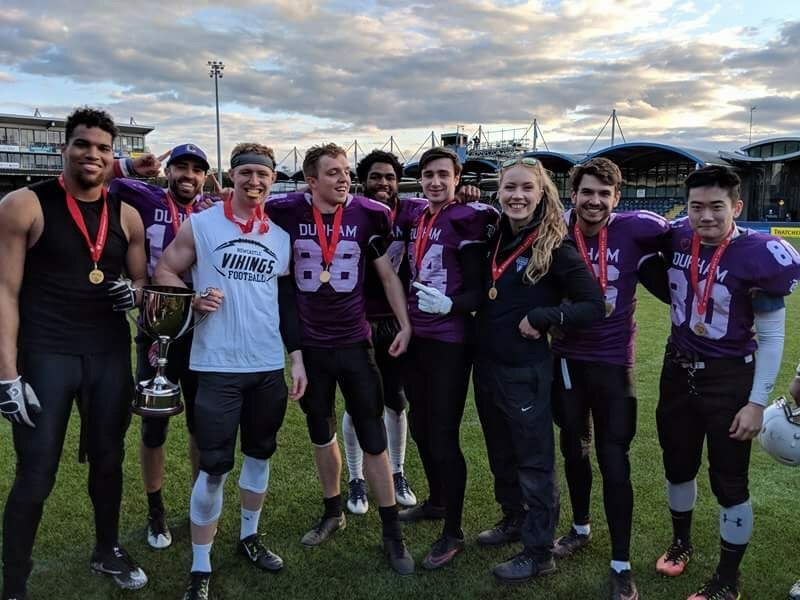 After speaking to a few coaching friends of mine about doing this, I was invited by Coach Rooney to become a positional coach with Durham University American Football team, working with the receivers. Prior to the 2017/18 season beginning, I spent many an afternoon with Coach Rooney to learn more about the practical and theoretical sides of the game. I had great fun learning and running routes in the summer sun – definitely got rather burnt one day and fell flat on my bum in the mud another. Over the playing season I shadowed Coach Rooney learning from his vast knowledge and that of the returning players and American scholars. I planned drills and put them into practice under Coaches guidance. I also worked alongside our game day therapist to provide care during the week, doing injury assessments and giving injury care advice and treatment when needed. Game days I found the hardest to adjust to. Having watched the game on the sideline as a therapist for years, it was hard to get out of the habit of watching a few seconds behind the game-play to ensure everyone was in one piece. I had to be really conscious not to do this but to watch my receivers in real-time instead. It was also hard to hold myself back when injuries occurred as it’s my natural instinct as a therapist to run on-field. I was on hand to help of course, but my role on game day was coach, not therapist. Another area I found challenging was keeping up with the speed of the plays, and breaking it down in time before giving feedback. I’m sure this will come with more experience as a coach, as I can comfortably do this as a strength coach and therapist after many years. Thankfully I was working with some great coaches who helped guide me with this. This 2017/18 season we went 8-0. On the 24th March the team travelled down to Coventry the night before the final. 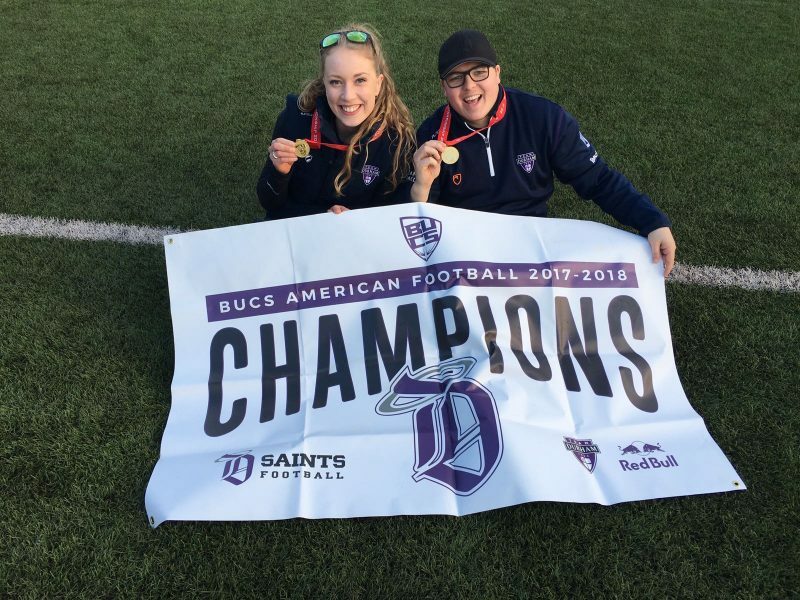 On the 25th March we were crowned BUCS National Champions at Sixways Stadium, Worcester, after a hard fought game against the Derby Braves. On our first away trip to Derby our coach got stuck in a snow blizzard. After several attempts to free the bus , the whole team came together to push the bus out of the snow and back on the road. Working with like minded coaches who are just as passionate as myself about the game and player welfare. Seeing the rookie players develop their skills over the season. They are now becoming great football players! Learning from the best – all the coaching staff, including the scholars, who taught me a lot from their wealth of experience. Motivational Speaker Jim Rohn said we are the average of the five people we spend the most time with. Well, if I can gain at least a quarter of my fellow coaches knowledge, then I’ll be happy! And because we have fun outside of practice too – our coaches Halloween night out. Enough said. 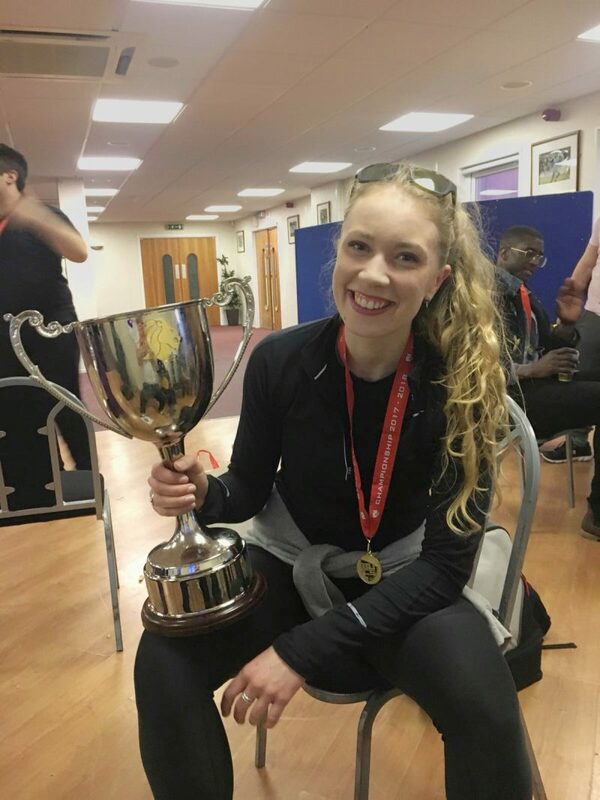 Last but not least – winning the National Championship of course! I couldn’t be happier for the team! This was our Redemption year. We had a job to do, and we did it! I know that from working with the Durham Saints, each player and coach truly deserves what they got out of this season. The hard work and focus was unbroken. 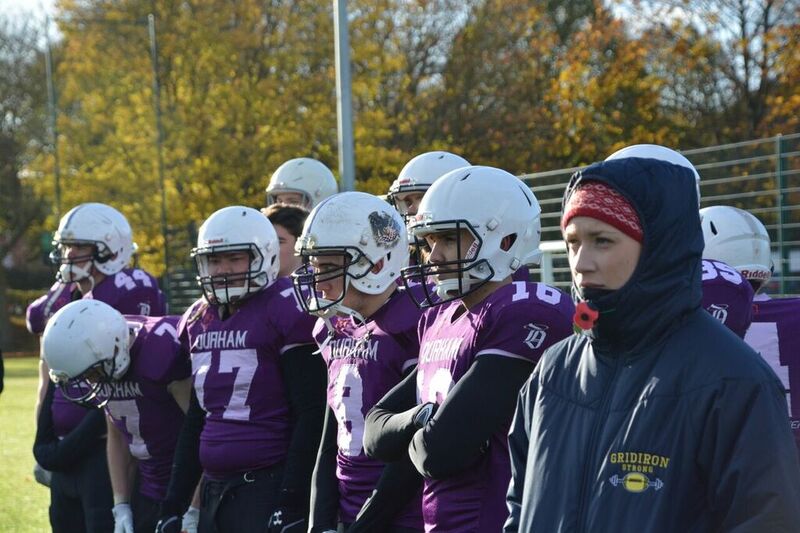 Everyone in the Durham Saints simply loves football. I still have so much to learn about the game. I don’t believe I will ever stop learning. I’ve thoroughly enjoyed my first season and am really looking forward to the next. I’m really going to miss the Saints in our off-season! Thanks for a truly great 2017/18 guys! – Especially to Coach Rooney for giving me this opportunity!